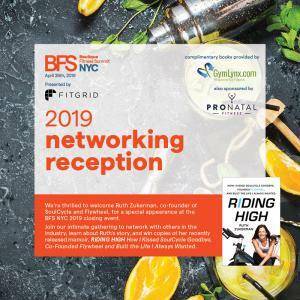 NEW YORK, NY, UNITED STATES, April 3, 2019 /EINPresswire.com/ -- BFS, the trusted fitness community hub for business management solutions, announced that Ruth Zukerman, co-founder of SoulCycle and Flywheel, will make a special appearance to close out the interactive, immersive one-day Boutique Fitness Summit, sharing her story and signing copies of her recently released memoir, RIDING HIGH: How I Kissed SoulCycle Goodbye, Co-Founded Flywheel and Built the Life I Always Wanted. The conference’s full day of programming for boutique fitness studio owners, operators and industry professionals will be held April 26, 2019 at the Wyndham New Yorker Hotel in New York City. "My whole career—and my intent in writing a book—was to inspire people and let them know that even when we go through challenges, we're never alone," Zukerman says. "That's why I'm looking forward to connecting with the strong, supportive community of studio owners who connect and collaborate through Boutique Fitness Summit, with its invaluable opportunities for collaboration and continuous learning with the next generation of fitness leaders." “We’re proud that BFS has forged a path as the premier solutions-oriented conference for owners focused on taking their boutique fitness businesses to the next level," said Nt Etuk, co-founder of Boutique Fitness Summit. “Our model and mindset recognizes that everyone in our community—from the partner-vendor, to the fledgling single-studio owner, to the scaled-up franchisor—is a knowledge provider and a knowledge giver. Our goal at BFS is to create the community and trust that leads to actionable connections that empower people to build successful brands: supportive and insightful conversations, happening among the right people, at the opportune moment." — Do Online Streaming Services Fit Into Your Business Model?